Beneath Interbike, some said, is where the “real bike show” was. They had a bike check room there (video podcast to follow) with all sorts of bikes. 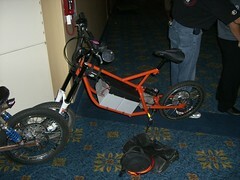 Outside of the room, I met Stephen “Speedy” Delaire of Rotator Recumbents and Brian Hall of Thunderstruck motors. Also present was Peter Poxton of Nuvinci. I think this photo shows a newer version of the Jackal running Nuvinci, which will produce a neck-snapping 45 mph without gears. Also see an even more massive electric bike. Previous Previous post: Reelights Pedal Powered LEDs—KISSably good.